Begin scouting fields to establish where your soybean aphid field infestations are at this time. 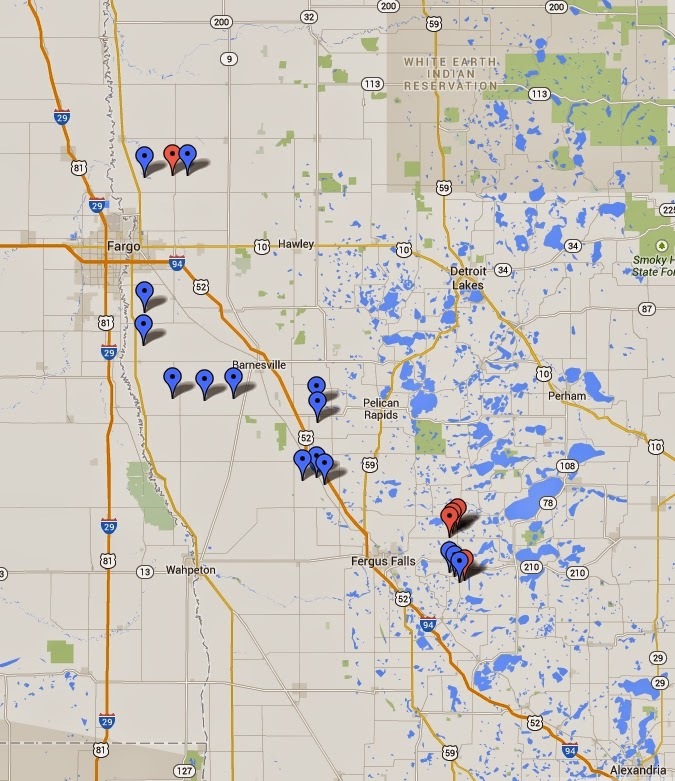 Here is a captured image from Google maps showing our first soybean field scouting reports from around the southern end of NW MN. Most of our scouting detected no infestations based on random plant selection/scouting. Aphids have been found in fields, but the numbers have been well below treatable populations. Scouting activities did find a field (indicated by red marker) with low level of aphids on Thursday, July 17. Plants with aphids on them represented ~30% of the plants inspected (~70% had "0" aphids). When aphids were found, numbers were well below 20/plant. Scouting in the Underwood, MN area. Aphids were observed in fields, but the infestations were generally light. Plants with aphids present accounted for under 25% of those sampled. When aphids were found, they numbered less than 10 aphids/plant. One sampled plant had ~40 aphids; no other "hot spots" in the field were noticeable. In other words, still quiet though aphids are out there. We have seen aphids in some research plots, though those numbers have been very small. These finds have been individual winged aphids suggesting there is some migration occurring and field dispersal and colonization is underway. Our early observations should NOT be interpreted as no aphids in soybean fields. It only means that we've had difficulty finding them in the fields we selected to scout. There ARE soybean aphids in the fields though at low numbers that are difficult to detect with random sampling. 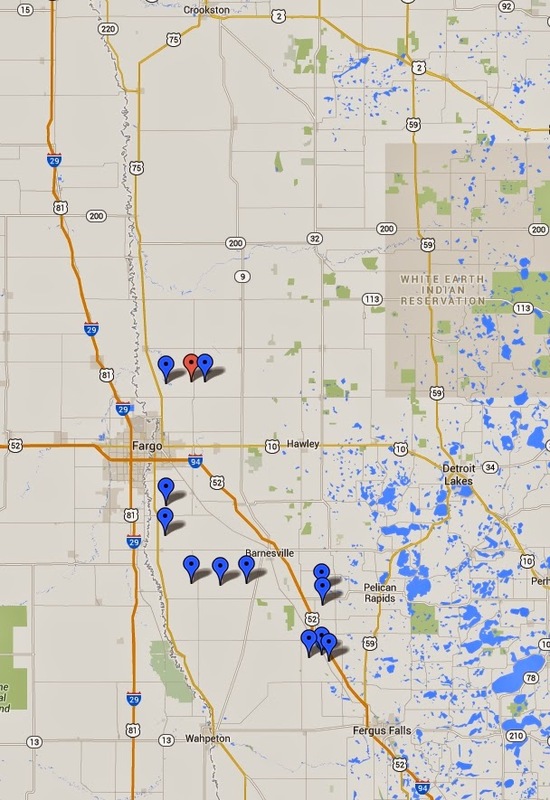 Your first scouting efforts may want to focus on past field sites where you have detected your earliest infestations. Several factors increase the likelihood of aphid problems. In spring, aphids are often found first in geographic areas with abundant buckthorn. Smaller fields with wooded borders are often the first to develop large populations. In NW MN, field edges, especially next to shelterbelts (with and without buckthorn), are often infested first. Wooded waterways next to fields have been a likely spot to find early colonizers. The earliest planted fields often attracted aphids during migration from buckthorn. These early fields likely have better developed canopies, are at a later growth stage and subsequently are a better nursery for building aphid populations. We aren't the only ones having a tough time finding aphids. 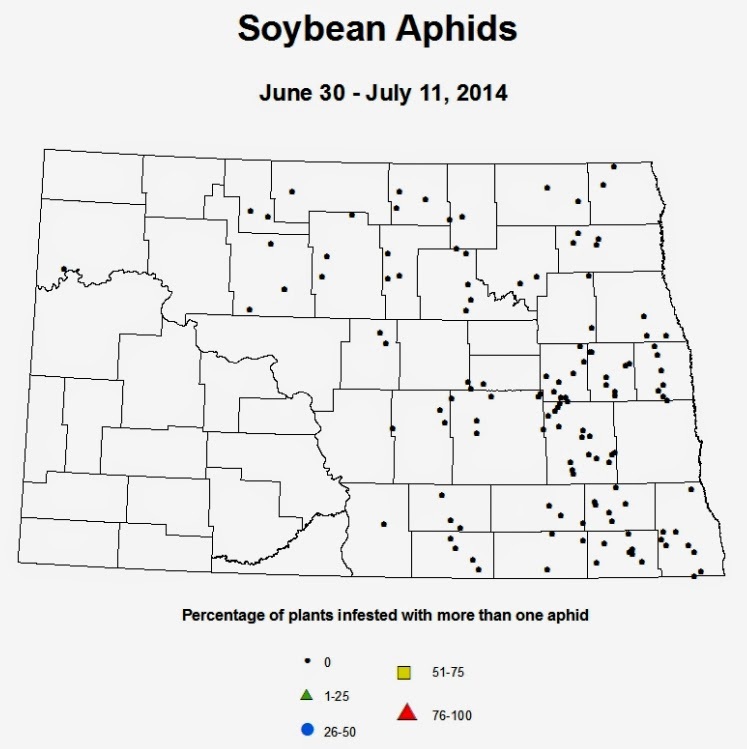 The NDSU IPM Survey has begun scouting soybean fields in North Dakota. Their scouts failed to find aphids in fields sampled this past week. Finally, there are reports of soybean aphids in southwest Minnesota to areas of west central MN. There are no reports of spraying at this time, as most populations are well below treatable numbers in those areas.